Cozymole stock a great range of children's walking boots from manufacturers such as HI-TEC and Berghaus, as well as a very good range of adult walking boots, sandals and footwear. 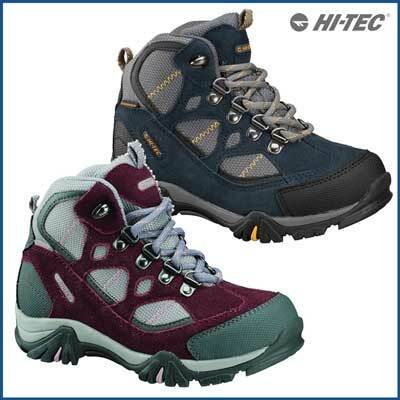 HI-TEC have really progressed in the last few years, and are now front runners in innovation, style, comfort and functionality. Their recent introduction of ion-mask™ technology onto an increasing range of their adult walking and adventure shoes is a first for the industry. Similarly, in their range of children's walking boots and shoes, they have taken care to provide the right features and comfort to encourage little feet to take the next step. HI-TEC have a much larger range of childrens walking boots than almost any other footwear brand, and we are pleased to offer you their range. All products are technically capable and well priced. Even their apres-ski and winter boots are very attractively priced and perform superbly, enabling children to stay out longer, in comfort , being happy! Almost all their childrens walking footwear is guaranteed waterproof, and there is a range of styles available for everything from the lightest construction through to a full leather traditional walking boot. HI-TEC pride themselves on 'instant comfort' and their products are designed to be useable out of the box, not requiring excessive breaking in or conditioning - another feature which gives your kids the best chance of enjoying their walking or outdoor pursuits. By using their Comfort-Tec sock liners, qood quality leathers and materials, and other technologies such as lightweight compression moulded EVA midsoles, your childrens comfort is in good hands. The Berghaus Raid Junior is a children's walking boot available in alternative designs for Girls and Boys. We've chosen these boots because they have a superb Vibram sole; they're waterproof; the construction and quality is first class; and kids love the feel and style of them. Featuring Vibram® sole technology to aid traction and durability, Berghaus childrens walking boots keep young feet planted whilst on the move - if you've never experienced Vibram before we would strongly endorse their sole units: their special compound gives superior levels of grip compared to many other boots, which soon gives kids much more confidence when slopes get steeper or rocks get wet. Waterproofing membranes incorporated into the waterproof range of Berghaus childrens walking boots give day long comfort for your children's feet, whilst offering the ability to shrug off the occasional puddle or downpour. Reflective tapes on Berghaus boots offer maximum visibility in poor conditions for safety. Berghaus use suede and textile upper construction in their range of childrens boots as it offers comfort and breathability whilst on the move, even from the first wearing, plus real flexibility when moving over rough ground.